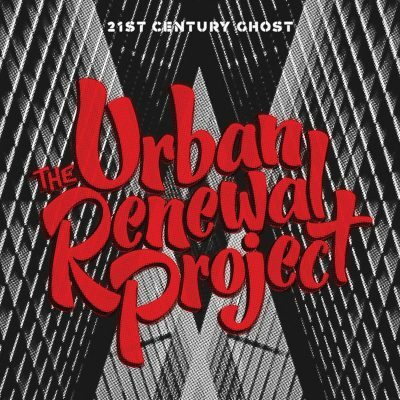 My first thoughts upon hearing a few tracks from The Urban Renewal Project’s latest album, 21st Century Ghost, was that they sounded eerily similar to ’90s one-and-done Camp Lo. (I know Camp Lo made more than one album, but most folks can’t tell you anything about any of them but Uptown Saturday Night, their first.) So, I wasn’t at all surprised to learn that Camp Lo is featured on 21st Century Ghost. I should clarify that this album doesn’t sound like Camp Lo alone, absolutely not. It does on just a few of the songs, namely those that Sonny Cheeba and Geechi Suede appear on. There is a lot more to hear throughout the sparse 10-track album. The Urban Renewal Project consist of a large ensemble of horns, which bring a ton of traditional, original jazz music to the forefront of something that sounds new and refreshing. Add on to that lyrical optimism about an ever-changing and always plugged-in culture, and you have an inkling of what the album sounds like. Initially, I thought that 21st Century Ghost would be more hip-hop than it is and was excited to give it a try. I was a bit thrown off by all of the songs that had no hip-hop in them at all, but continued to listen. I ended up OK with the mixture. Hip-hop and jazz music can go hand in hand—there is even a label for it—so it isn’t new. A lot of the older hip-hop artists who pulled influences from jazz used classic and groundbreaking samples, which resulted in the jazz rap label. But some took it further, like Guru of Gang Starr whose Jazzmatazz album series infuse true hip-hop music with live jazz in the studio. Those albums were cool, but they always conjured images of a smoke-filled room where one could go to soak up some of the world’s more depressing occasions. (I am specifically thinking about “Sights in the City.”) 21st Century Ghost is every bit as jazzy and musically inclined, but so much more upbeat and lively. Just like Camp Lo’s “This is It,” The Urban Renewal Project have created something to get people out of their chairs and onto the dance floor.